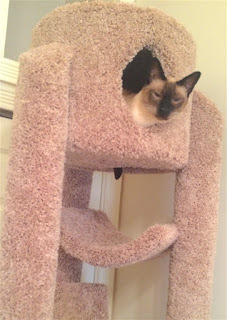 Yay, Mr. Fuzz likes his expensive new cat tree! Since my new place is smaller than my old one, I felt bad for my cats who have less room to run around. So I figured I would let them have a vertical option - the cat tree is right next to a storage closet - they can hang out on the cat tree itself or go up into the closet for extra amusement. The storage closet is way high up near the ceiling and the ceilings in this place are so high, I can't even reach them with a broom standing on tip-toe. Miss Willow hasn't even sniffed the damn thing as far as I can tell. She always was very conservative. But there's plenty of room in this tree for two cats Miss Willow!